All bookings and timetable requests for our Scottish Express services are taken by telephone only. Call us on 01382 227 290 and select option 1. Lines are open Monday to Friday 0900-1200 and 1300-1700. Due to low passenger numbers, we have withdrawn this service. Our 226 Arbroath to Fort William service still operates fortnightly on a Tuesday. Due to low passenger numbers, we have withdrawn this service. 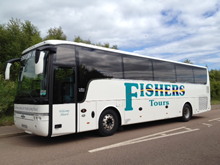 Our 228 Arbroath to Inverness service still operates fortnightly on a Thursday. This service will continue to operate on a Friday fortnightly, but on the opposite week to previous years. There are no other changes to the timetable. The operating day for this service is changed to a Thursday fortnightly, between January and October, then weekly in November and December. An additional stop has been included at Perth Edinburgh Road at Tesco. There are also minor adjustments to the timetable. This service is curtailed to start and finish at Glenrothes and has been retimed to improve its reliability. Passengers from Dundee can still get to Oban on our Wednesday services 222 and 248. An additional stop has been included at Perth Edinburgh Road at Tesco. This service will continue to operate on a Friday fortnightly, but on the opposite week to previous years. There are no other changes to the timetable. A new service, running fortnightly on a Wednesday, from Forfar, Kirriemuir, Blairgowrie, Perth and Kinross, travelling via the Gyle Shopping Centre (where passengers can transfer onto a local bus or a tram for transport into Edinburgh), IKEA at Straiton, Peebles, Galashiels, or points inbetween. Please refer to the timetable for full details. A new service, running fortnightly on a Tuesday, from Arbroath, Carnousite, Monifieth, Broughty Ferry, Dundee, Glenrothes and Kirkcaldy, travelling via the Gyle Shopping Centre (where passengers can transfer onto a local bus or a tram for transport into Edinburgh), IKEA at Straiton, Peebles, Galashiels, or points inbetween. Please refer to the timetable for full details.